NOTES: Multi-media kit with vac and resin parts. Two aircraft that are etched in the minds of Britons and aircraft enthusiasts everywhere are the Spitfire and the Hurricane. The Spit got all the glory and the Hurricanes did much of the hard work. Both were used from Day One in the RAF and while the Hurricane was soon relegated to ground attack, it also continued to the end with the Spitfire. 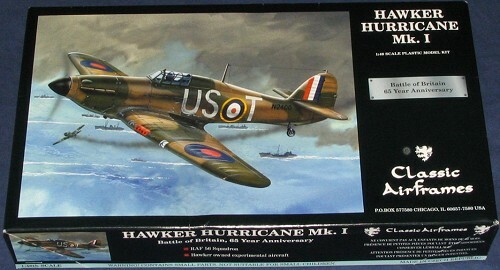 The first truly modern RAF monoplane fighter was the Hurricane. Its tube and fabric construction was about the only hold-over from the biplane days. It had an enclosed canopy, powerful Merlin engine and retractable landing gear. It was also much faster than its biplane contemporaries, though, thanks to only one wing, couldn't dog-fight quite as well. No matter, its speed alone allowed it to enter and leave combat with these types of aircraft at will. It was also quite ruggedly built and thanks to its simple construction and ease of repair, was just what was needed in places where conditions were, well, less than ideal. Bearing the brunt of the air fighting with the British Expeditionary Force in France during May/June1940, these types were able to hold their own against the German Bf-109E-1/3. Much of this was due to the quality of its pilots for the 109E did have a slightly higher level of performance and often the Hurricane was the victim rather than the victor. Thanks to is rather heavy weight of fire (albeit from rifle caliber guns), it was able to chew through German bombers with considerable success later in the Battle of Britain. It was in this role that it gained considerable success. The fight in France was pretty much the swan song for the 'rag wing' Hurricanes, though a few did hold on to fight in the Battle of Britain a couple of months later, before they, too, were replaced. This Hurricane from Classic Airframes is the best kit of the 'rag wing' Hurricane to date. I While still a limited-run kit, this Hurricane will look very good sitting next to its brethren who began life in Japan. 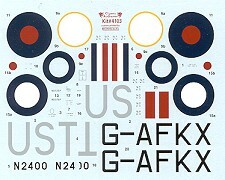 In fact, this kit is in some ways, even more accurate than the later Mk.I versions done by Hasegawa. 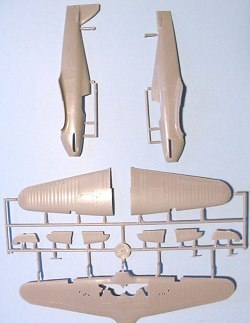 This is noted in the superior fit of the wings to the fuselage and the additional detail in the cockpit. 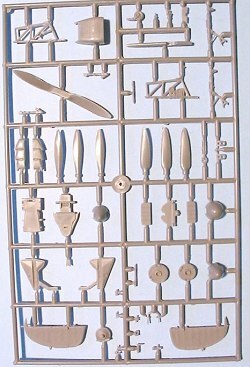 The kit comes with a number of optional bits, some of which won't be used on this version. You get three different props ( a two blade Watts and three blade versions from Rotol and DeHavilland), two different rudders (one for early planes without the ventral strake) and two different exhaust; standard ejector and the 'kidney' exhausts. You also get early and late production canopies as well as spares. Having built this kit (though in the Belgian boxing), I can tell you that it makes into a really superb model. All you really need to do is to add some seat belts to have a most complete model. There are basically two aircraft done in this boxing. One is the box art aircraft from 56 Sq. It has a three blade DeHavilland prop. Not many rag wings Hurricanes were still in front line service by mid 1940 and this is one of them. The other is a Hawker test aircraft in overall silver dope, It has large civil codes on the fuselage and that is it. It uses the Rotol three bladed prop with the blunt spinner and will make for a most interesting diversion from the usual warbirds! If you missed this kit on its first time around in 2003, you now have a chance to grab it with this boxing. Those of us who want to do another set of markings from an earlier pick and also missed getting a second kit will be able to take care of that mistake. Either way, this has to be one of the nicest kits that Classic Airframes has done and you really should pick one up and give it a whirl. My hearty thanks to Thanks for your support.